Love token jewellery, with its elaborate symbolism of affection, was abundant during the Victorian era, particularly during the romantic period of Queen Victoria’s reign. The 21 years following her marriage to Albert in 1840 were the happiest of Victoria’s life, and Prince Albert often presented his queen with gifts of romantic symbolism, and his gestures led to a flourishing trend. One cameo is a distinct scene from an ancient Pompeian wall painting that became famous after the excavations of the 18th and 19th centuries. These classically themed cameos demonstrate the Victorian art of combining elaborate cultural and romantic symbols within a single jewel. Love token jewels took many forms and expressed multiple sentiments, from familial affection to romantic love and memorial devotion. They were often explicit in their intention, with recognizable symbols. Types of flowers and gemstones all had distinct meanings. For example, specific colors conveyed stages of devotion, and certain motifs displayed various concepts of love. Even the actual form of the jewel often relayed certain affectionate tendencies. Some symbols, such as hearts, were clear indications of love, and acorns were thought to be emblems of fidelity. Queen Victoria’s betrothal ring showed an encircled serpent biting its own tail which, in many ancient cultures, represented concepts of eternity. The late Georgian period was a precursor of the symbolism and romanticism of Victorian-era jewellery. The eye brooch was a perfect demonstration of the period s preoccupation with sentimentality and complex allusions. The eye acts as a window to the soul, leading to the heart. What better representation of true love? The eye brooch evolved and became popular again two centuries later, partly out of the necessity for discretion between covert lovers – once again, a king set the trend, as the first pair reported to have exchanged such brooches were King George IV and his mistress. A miniature that mysteriously depicted only the eye of a paramour meant secrecy could be preserved. Jewels of affection were also given as wedding gifts. 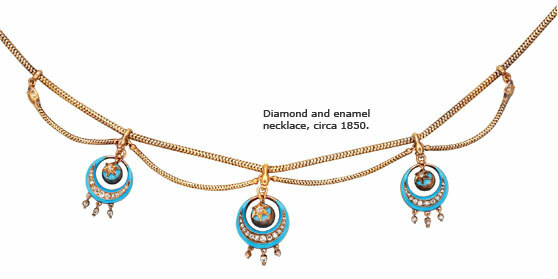 The turquoise enamel in the necklace pictured here represents the forget-me-not flower, which symbolizes true love. The serpents suspending the pendants expand on this notion, as emblems of eternal love. The pendants, shaped like crescent moons and decorated with stars, relay wishes of good fortune and successful future generations for the newlyweds. A bouquet of flowers was often sent to a young Victorian woman by her suitor to reveal his intentions. This type of declaration was so popular during the 19th century that numerous books were published detailing all the possible meanings of each flower. Jewels of the 19111 century often feature floral bouquets with emblematic flowers, such as this pietre dure brooch (hardstone carved as a mosaic into images), containing a rose, cosmos and lily-of-the-valley. A readily decipherable message, known as an acrostic, was also popular. It consisted of a collection of flowers in which the first letter of each flower name combined to create a sentimental word. Acrostics can be found in jewellery made throughout the Victorian era, with words often spelled out by taking the first letters of colored gemstones. For example, a jewel containing a diamond, emerald, amethyst, ruby, emerald, sapphire and topaz would relay the message “dearest.” Likewise, the coronet brooch pictured here spells “peace” with a pearl, emerald, amethyst, chrysoberyl and emerald. These hidden meanings are part of the endless mystery and attraction of antique jewellery. 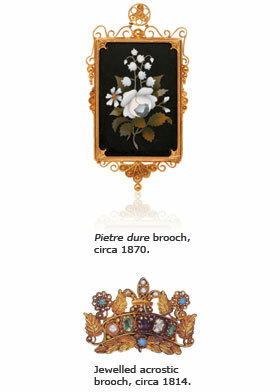 The popularity of the eye brooch peaked during the early 19th century, as its intent and purpose evolved. It was quickly adopted as a memento within families, especially between sisters who were parted due to marriage, as well as memorial brooches for the dearly departed. While the eye brooch, for no noted reason, faded from favour towards the middle of the 19th century, it has since become a rare antique jewel for collectors, illustrating the sentimentality and romanticism of the Georgian and Victorian periods. With the revival of antiquity in the late Victorian era, Greek and Roman mythology began to have a persuasive influence on love token jewellery. Cameos became the means by which to depict these ancient myths. 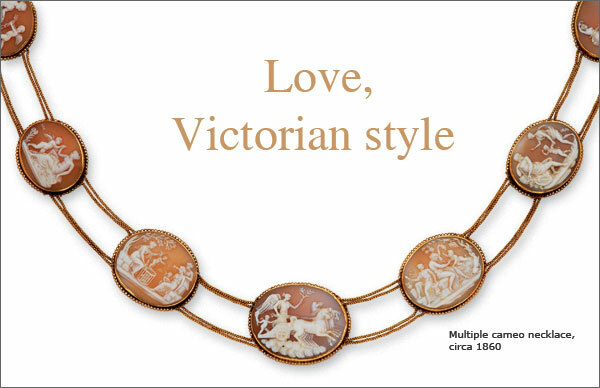 In the Victorian shell cameo necklace pictured at left, eight cameos are joined together based on the related themes of passion, love and marriage. Each depicts a scene centred around Cupid, with representations of classical characters such as Venus and her husband Vulcan; Bacchus and Pan, fellow gods of eroticism; Psyche, Cupid’s mortal love; and an allegory of Victory.